Today was our first day of school, and our kids were so excited! 1. My mother-in-law gave us one of her small bookshelves to put our books and other materials on. This is helping me to stay organized and have all of our materials right at hand. 2. We bought a large white board for our empty wall space, and we put a small cork board next to it for displaying artwork, announcements, name plates, etc. 3. We color-coordinated the children’s materials in order to keep their materials separate. Our daughter chose red (her favorite color), and our son chose blue. This will help us stay organized throughout the year as we are teaching separate levels of learning. 4. We bought storage boxes (plastic, clear shoe boxes) for organizing art supplies, craft items, and other odds and ends. 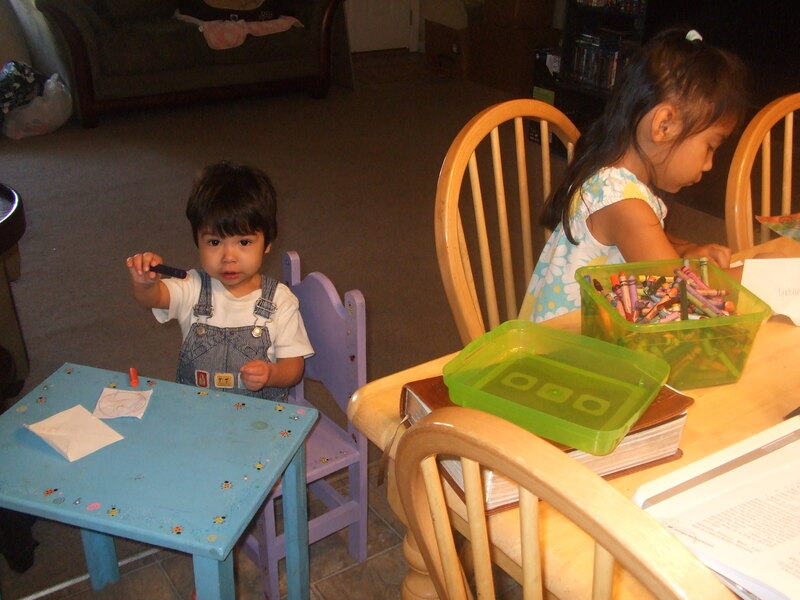 Our son is doing Tot School right now, and our daughter is in K4. So I had to figure out a way to keep his attention while I worked with her, and I have to keep her busy while I work with him! Bible time is fairly easy, especially since we are using the Answers in Genesis curriculum for Pre-K. But once we got into the regular subjects, I knew I would be in trouble! Fortunately, I was able to find Tot School curriculum that went along with the material Hannah was studying from Ready-Made Preschool. This week, we are reading the book Chicka Chicka Boom Boom by Bill Martin and working on alphabet skills, crafts, and name recognition. Today, the kids were introduced to the book. We sang “The ABC Song” while throwing the letter cards on the floor. And we placed alphabet letters with play-do on our coconut tree. Ephraim is working on a lap book that I put together. Inside are pockets for his alphabet letters and numbers. He also glued together “coconuts” to spell out his name. And he will be coloring a coconut tree tomorrow. Hannah and Ephraim both made coconut tree pictures by putting brown paint on their arms to press onto paper for the trunk. And they put their green hand prints on top for the branches. Hannah had a lot of fun placing alphabet stickers all over her tree! Separately, Hannah worked on learning the number one. She also drew a picture of her daddy and then cut and pasted pictures of men who looked like they could be daddies. This was a part of her Answers in Genesis curriculum. 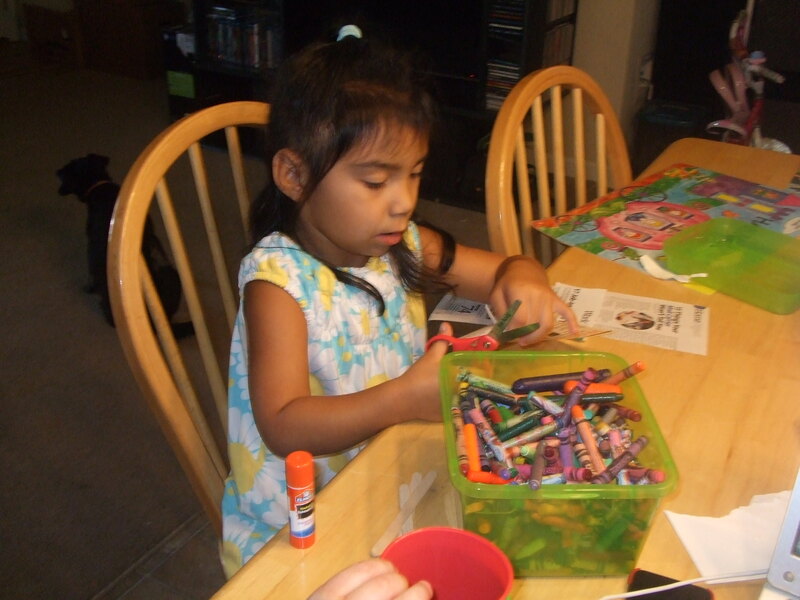 She loves to cut and glue, so she spent quite a while working on this craft! Ephraim was also introduced to Tot Trays today. 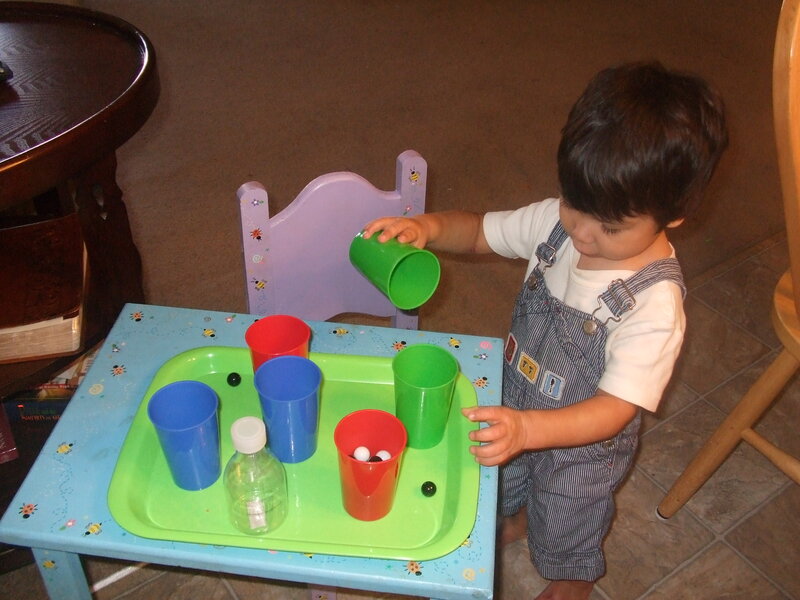 We are working on pouring this week, so he had a couple of different objects to pour into and out of colored cups. He loved it so much that he didn’t want to move on to anything else! He also played with letter blocks and with his alphabet caterpillar. Another part of his education is learning about the different parts of the body, so the Touch and See Dog was a wonderful toy to add into our day! I am also trying to make theme days with Hannah. Monday is Missionary Day, so we are studying the missionary Amy Carmichael. We are reading With Daring Faith by Rebecca Davis, who wrote a wonderful biography on Amy Carmichael for children. I am passionate about missions, and I want my children to know about missionaries early in their lives. We are also studying India, where Amy Carmichael ministered, and we will be praying for some missionaries who are in India right now. Hannah especially loved hearing about Amy Carmichael and could recall all of the details at the end of the day! We also made sure to spend some time outside, riding bikes and playing in the dirt. One of the benefits of home school is being able to incorporate play into our school day! Hannah made some interesting “finds,” which I quickly turned into a science lesson. I also made sure to put books down on the low shelves that would reenforce what the kids are learning this week. I think that reading at an early age is extremely important, and I want that to be a natural, daily activity for us! Two things I learned from our first day in home school were flexibility and patience! The young children especially do not have the attention span to sit through all the material at once, so let them determine the schedule of things (to some extent – obedience is still important!). And I really had to exercise patience as the children were so excited about their new school that they wanted to dive into everything right away! 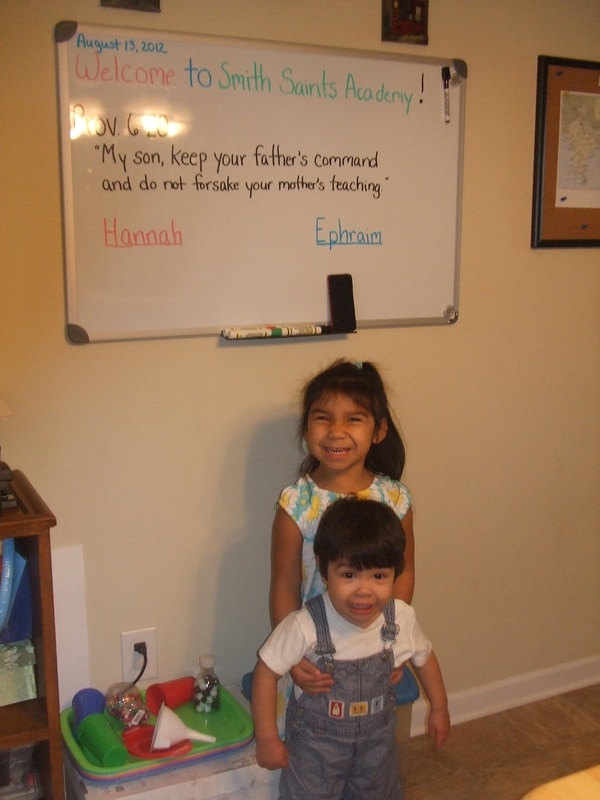 One of the main reasons we have chosen to home school is because we want to be able to teach our children from the Scriptures. So it seemed only right to choose a theme verse for our school this year. “My son, keep your father’s command and do not forsake your mother’s teaching. 21 Bind them always on your heart; fasten them around your neck. 22 When you walk, they will guide you; when you sleep, they will watch over you; when you awake, they will speak to you. 23 For this command is a lamp, this teaching is a light, and correction and instruction are the way to life” – Prov. 6:20-23. I’m new at this, so I would love to hear what other people are doing for home school! This is such a wonderful gift God has given to us in being able to teach our children, and I just want to make sure that we are serving Him!